OUR GOOD FRIENDS in the Rockin' Jake Band were in Quincy last night, playing a show at the Club Tavern. 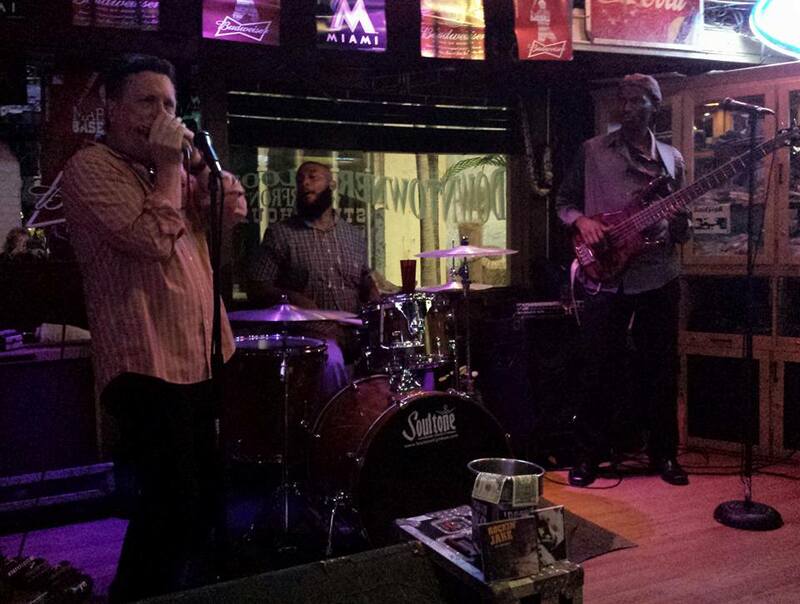 It's always a blast to see Jake, Cleveland, Maurice and new guitar player Mark Otis. 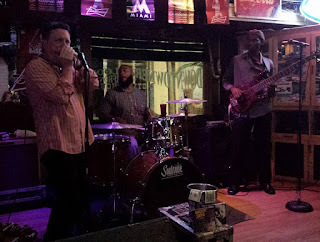 They tore it up on a weeknight in front of a great crowd - Quincy loves its blues bands, that's for sure. We've known Jake and the band for a few years since they played a Blues In The District gig sponsored by Second String Music. We sold Maurice a drum kit and he used it on the Washington Park gazebo stage that night. Sheryl also worked miracles and saved Cleveland's Ibanez bass from the scrap pile - he still uses it and it still sounds great. We were watching them last night and during the first break, Jake mentioned they were having a tough time finding a cheap hotel room. This is the start of an exhaustive tour for the Florida-based band, where they play every night and often rely on friends, new and old, to help them out. Playing in a touring band is a blast, but life on the road isn't easy. Sheryl and I would have gladly let the guys stay at the Hart Mansion in Calftown, but her nephew has taken over the upstairs temporarily. "You guys could stay at the store," I said. "Lots of room in the back. Air conditioning, clean bathroom, refrigerator and comfortable couches." Rockin' Jake knows about the back room at Second String Music - it's been his staging area for his Blues In The District shows. It was a hearty and grateful "YES." Of course, Maurice already had a place to stay... Drummers. GUH. They loved hanging with Fast Eddie and got a good night's sleep on the couches and floor mattresses. They got up early this morning and after coffee and donuts - a staple and must if you play in a touring blues band - they headed for Iowa. They have a good gig lined up tonight, with a plush hotel. Jake and the boys are hoping to come back later this month. They love the Q-Town. We love to help out a great band on the long and lonely blues road. It's a perfect match. Rock on, Jake. You always have a place to crash in when you come to Quincy. Christmas in August - new guitars! Why didn't I know about Steve Goodman?